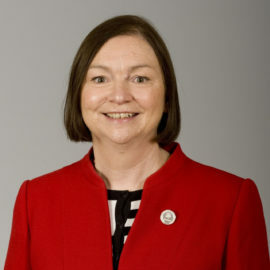 Dr Jean Venables, CBE FREng FICE MCIWEM, has a distinguished career in the field of water and the environment – flood risk management, water level management, catchment management – having been, amongst other major appointments, Chairman of the Thames Region Flood Defence Committee from 1994 to 2003 and Chief Executive of the (UK) Association of Drainage Authorities from December 2005 to March 2015. From 2014 to 2016, she was Chairman of the Nuclear Liabilities Fund, set up to provide the resources for the decommissioning of the fleet of eight EDF Energy Nuclear Power Stations in the UK. She and her husband and business partner Roger have been involved as consultants in engineering and the environment since the early 1990s. They undertook a range of research projects and other assignments at the core of the UK construction industry’s environmental improvement journey. Over recent years, the industry has fully embraced the sustainability agenda, for example the creation and development of CEEQUAL (see www.ceequal.com) for which Roger Venables, with Jean’s support, led the team that developed the Scheme and of which he was CEO until Autumn 2015. Professionally, Jean has been involved with the Institution of Civil Engineers (ICE) since graduation, where in 1973 the Association of London Graduates & Students promoted a conference on “Resources – tomorrow’s dilemma”. After periods as an elected member of Council, Jean was elected ICE President for the 2008-2009 year. She has remained involved as, amongst other roles, she is Chairman of the ICE Club, was Chairman of the ICE Professional Conduct Panel for six years to 2016, is a member of Royal Academy of Engineering’s Committees, and is a Member of Council and of the Technical Committee of the UK’s RNLI – see www.rnli.org). With the agreement that the ICE take on responsibility for CEE, Jean is delighted to have been asked to become its Chairman.